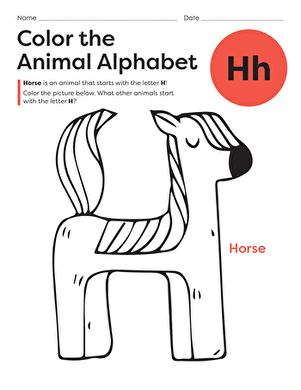 The animal lover in your preschooler will have a blast adding colour to this horse coloring page! This coloring page featuring a young girl grooming her horse will put your preschooler's imagination and crayons to good use! 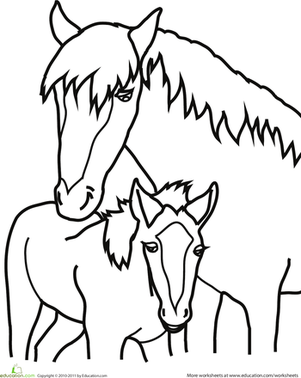 This coloring page features a mommy horse and her foal enjoying some special cuddle time. This is the perfect coloring page to show your preschooler where horses live. Add colour to the peaceful picture of the horse outside of the barn. Your preschooler will surely enjoy adding colour to this page featuring a jockey on his race horse jumping over a hurdle. Get into a playful mood with this cute rocking horse! Share a couple of crayons with your little one and give this happy horse some fun colors. Preschoolers will enjoy adding colour to this close-up of a graceful horse grazing on the grass. Preschoolers will be thrilled to bring this beautiful horse captured in mid-run to life by adding colour. Help your kindergartener add some bright, festive colors to the carousel horses on this cute, circus-themed coloring page. 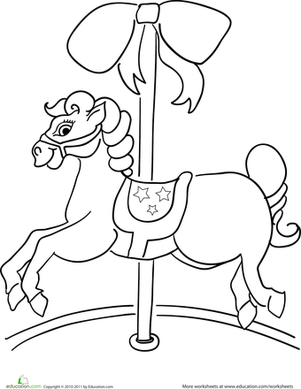 If your kindergartener loves riding the carousel, she's sure to love this carousel horse coloring page.